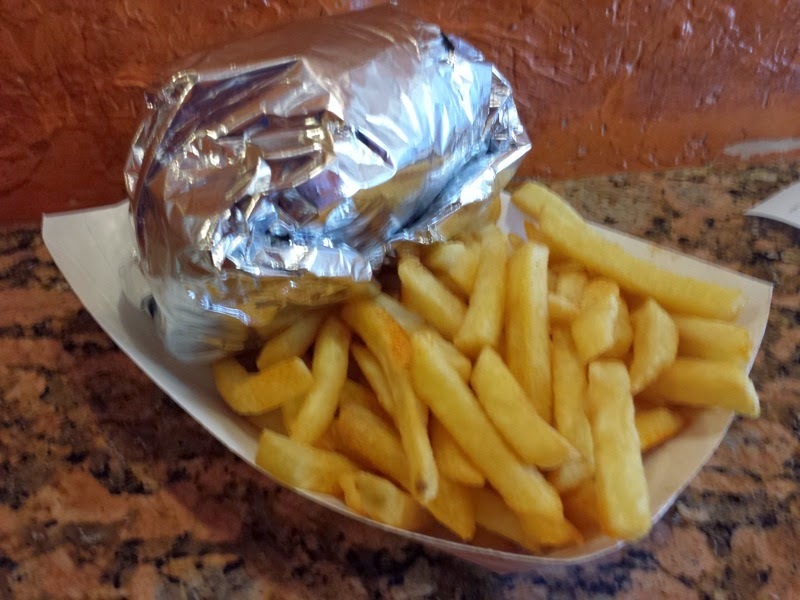 I've heard people rave about how good the food is at Junior Colombian Burgers on Kirkman Road for a long time. Being that I'm not a huge fan of hamburgers, I was always a little hesitant to try this place. Finally, I decided that it was about time. Would I find their burgers be dry, boring tasting pieces of beef like so many other places that supposedly have good burgers, or would a Colombian burger dress up the beef into something much better? On my second visit to the restaurant, I decided to actually try one of their burgers. I ordered their Combo #2 which came with the cheeseburger, fries, and a drink. 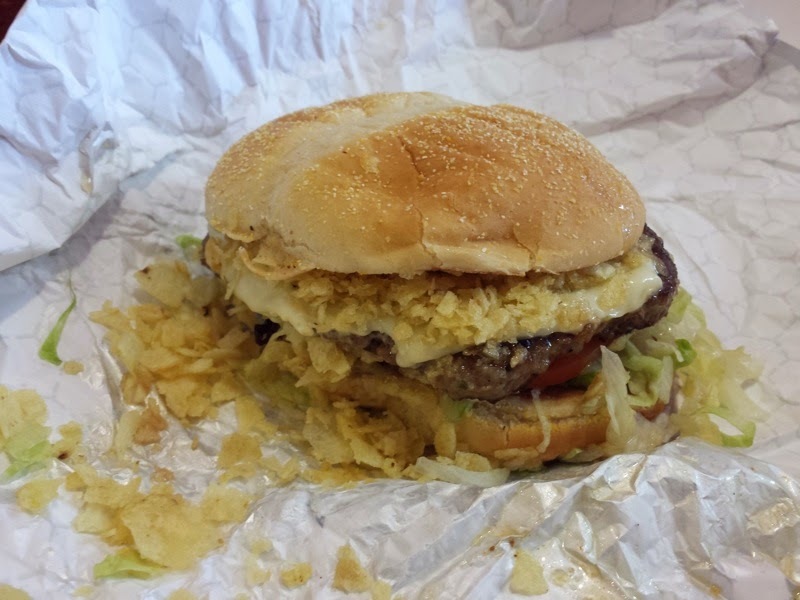 The burger consisted of a hamburger patty, cheese, lettuce, tomato, onions, potato chips, garlic sauce, mayonnaise, ketchup, pink sauce, and pineapple sauce. Did this burger pass the test of not being boring? Yes it did. The beef was very moist and had flavor. All the sauces were very tasty and blended together well, without one overpowering the others. The potato chips were interesting. They started out crunchy, but as they sat on the burger they started forming a mush that sort of reminded me of mashed potatoes. I liked my first experience eating a Colombian burger. The sandwich was nowhere as boring as most American style hamburgers that tend to leave me with a bad taste towards burgers. I'd return to Junior Colombian Burger! 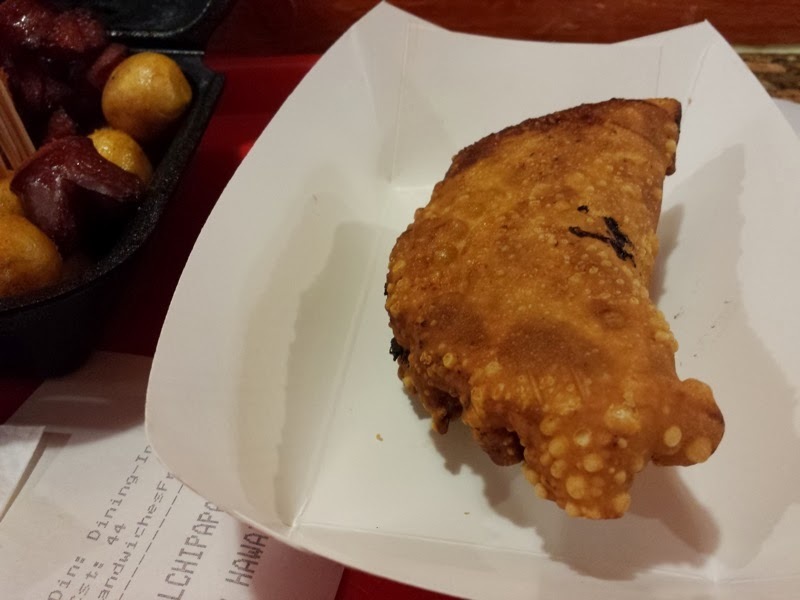 I had lunch one afternoon at a restaurant called Rocky's Pizzeria located along Turkey Lake Road in a shopping center next to Wal-Mart. 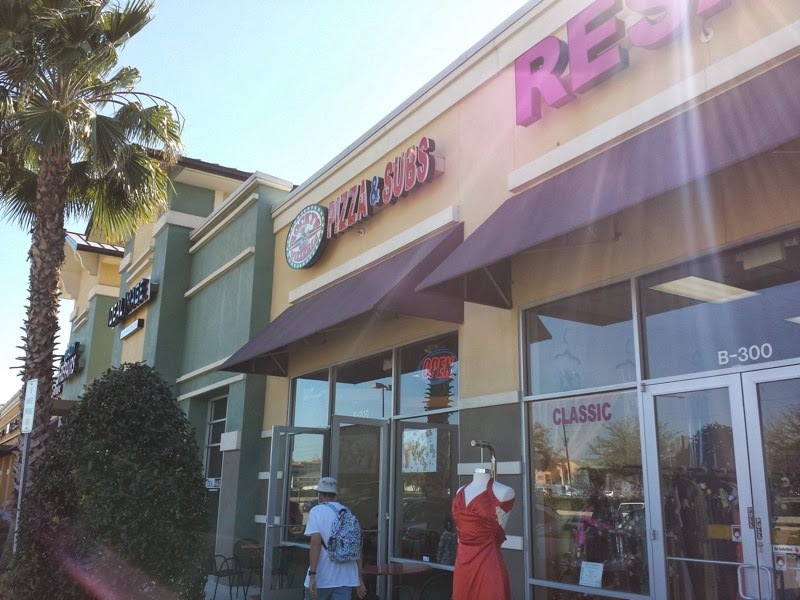 Pizza by the slice in Central Florida's strip malls sometimes seems like a questionable food adventure to me, just because I'm afraid of the turnover of the pies. If the pizza available for slices seemed past it's prime, I was prepared to order a sandwich instead. Rocky's had lots of customers when I walked in around 2:45, so I figured I wouldn't be eating a slice from the same pie that was made earlier that morning and was siting around all day long and decided to order their lunch combo. The lunch combo included two slices of pizza and a canned beverage. I'm glad I did go with the pizza rather than a sandwich because these were very good slices. This New York style pizza had a thin, slightly crispy crust. The cheese and sauce had nice, evenly spaced proportions. Nothing was dripping off the crust, nor was there a lack of crust coverage. The cheese was slightly salty and although the sauce wasn't a standout flavor, it added nicely to the overall pizza flavor. The outside crust was brushed with a garlic sauce which was a nice surprise when I got an extra bit of flavor that I wasn't initially expecting. 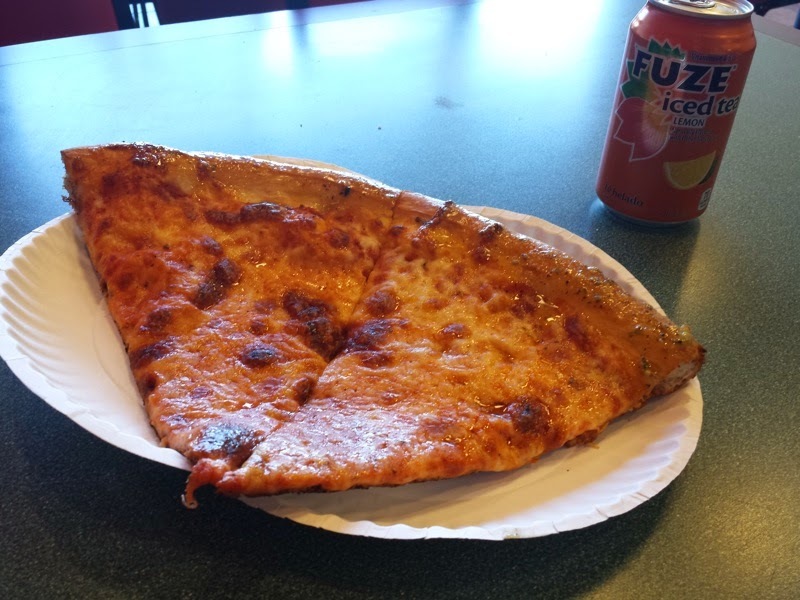 Based on my first experience at Rocky's Pizza, I think they may be near the top of my list of good New York style pizzas near International Drive. I found myself in Downtown Lakeland last Saint Patrick's Day. Roads were closed and there was a street party going on. Lots of people were getting drunk on beers dyed green with food coloring, but I was looking for dinner rather than alcohol. There was an Irish pub downtown called Molly McHugh's that would have been appropriate for the holiday, but they didn't serve food. Instead, I ended up across the street at 50s themed restaurant specializing in burgers called The Chop Shop. Since it was Saint Patrick's Day, I decided to go with their special and ordered the corned beef and cabbage sandwich. This large sandwich consisted of a large hoagie roll filled with corned beef, cabbage, and mayonnaise. The corned beef was thinly sliced, nice and tender, and had a good, somewhat salty taste. 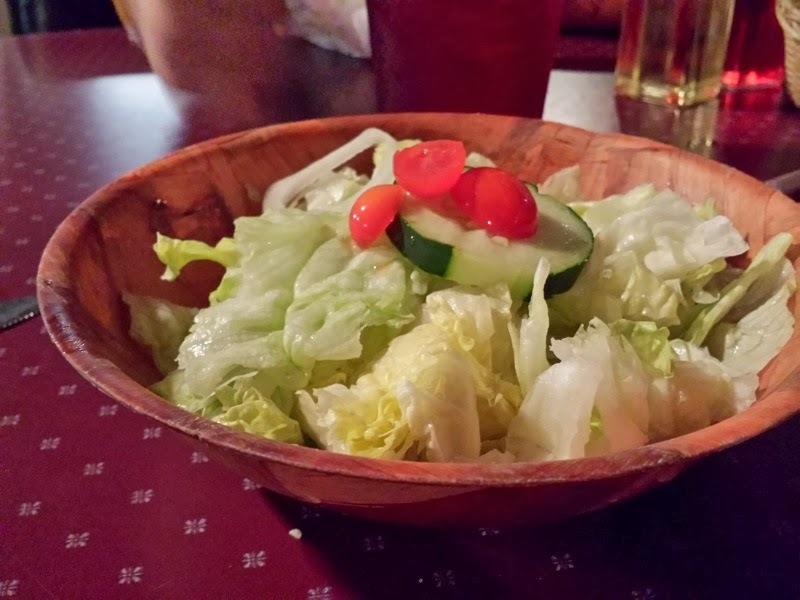 The cabbage seemed a bit more like sauerkraut than I was expecting, but that was fine with me. I like sauerkraut! Fries were served on the side. I enjoyed my slightly Irish inspired combination of flavors in my sandwich. Apparently corned beef and cabbage is an American invention and isn't actually a thing in Ireland (it's derived from the Irish bacon and cabbage dish). Does this make me, a person with no Irish heritage, eating corned beef on a sandwich with fries at a burger place as bad as all the non-Irish people using Saint Patrick's Day as an excuse to get drunk? 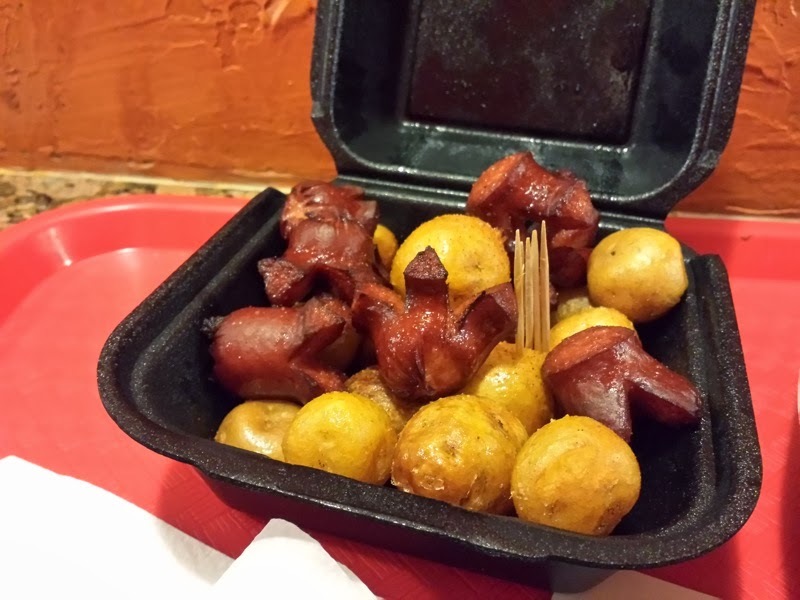 I ended up eating dinner at a very touristy buffet called Wood Grill Buffet along the sparsely occupied section of International Drive between Sea World and Disney. According to the host, Wood Grill Buffet was a completely independent, one of a kind, non-chain restaurant. Once we were eating, I did notice that the signs on the inside of the restaurant called itself Western Sizzlin's Wood Grill Buffet. According to their website, this was Western Sizzlin's only Wood Grill Buffet location, but they are definitely not as independent as the host said. I made two trips up to the buffet. On my first plate, I sampled a sundried tomato and sausage pasta, ribs, wings, fried okra, green beans, an onion ring and corn bread. The two standouts here were the ribs and the cornbread. The ribs were fresh (brought out a fresh batch as I was approaching the buffet) and the meat was nice and tender. The cornbread was surprisingly moist. Everything else on the plate was average. My second plate consisted of far too many carbs. I tried the macaroni and cheese, mashed potatoes, cheesy potato casserole, brussel sprouts, and a biscuit. The macaroni and mashed potatoes tasted like they were very mass-produced and seemed instant/microwaved. The grilled brussel sprouts were the highlight on this plate, and seemed unusual to be found on a touristy buffet. Wood Grill Buffet was a step above some of the other buffets on International Drive. It was definitely way better than a Ponderosa or a Sizzler, but I'd rank it below the touristy buffets at Disney. I had dinner at JC's Lobster Pot in Deland. 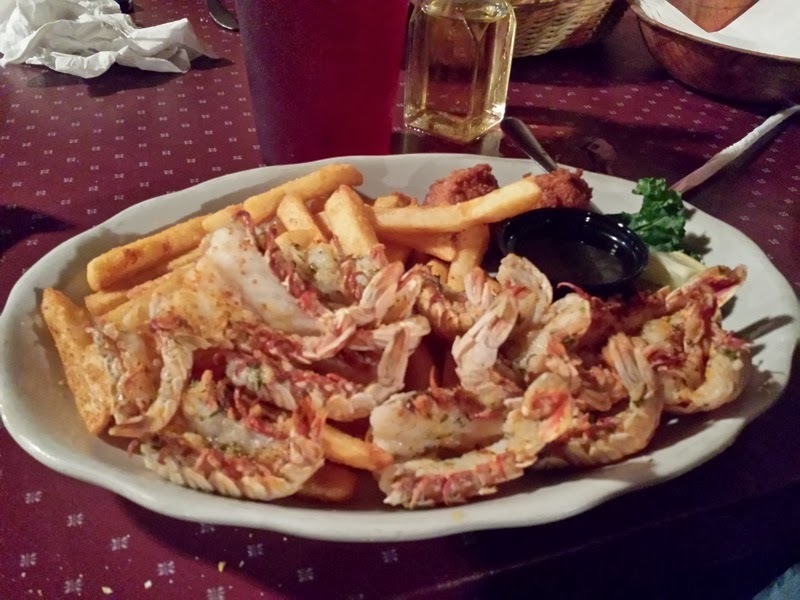 This seafood restaurant is located on 44, not far from the St. Johns River. When I entered the restaurant, I noticed they had a rock shrimp special. It had been a while since I've eaten rock shrimp, so I decided to give that a try. The meal began with clam chowder and a side salad. For the main course, I received a plate of just over a dozen large rock shrimp, butter dipping sauce, french fries, and hush puppies. The shrimp were very tasty, as shrimp dipped in butter should be. The hush puppies were good and the fries were okay but weren't a standout of the meal. 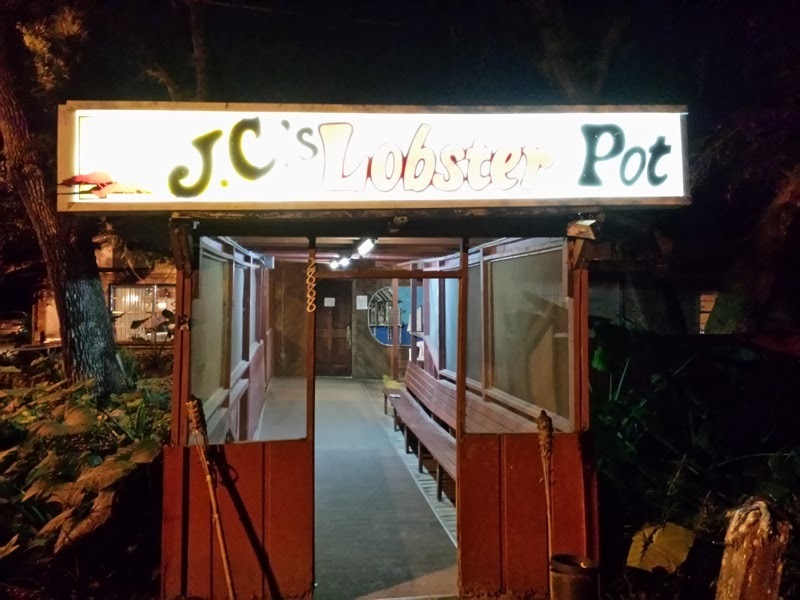 I never knew JC's Lobster Pot existed until I found it accidentally when my dinner plans at a nearby restaurant fell through. I'm glad I know about it now because I did enjoy my meal here! 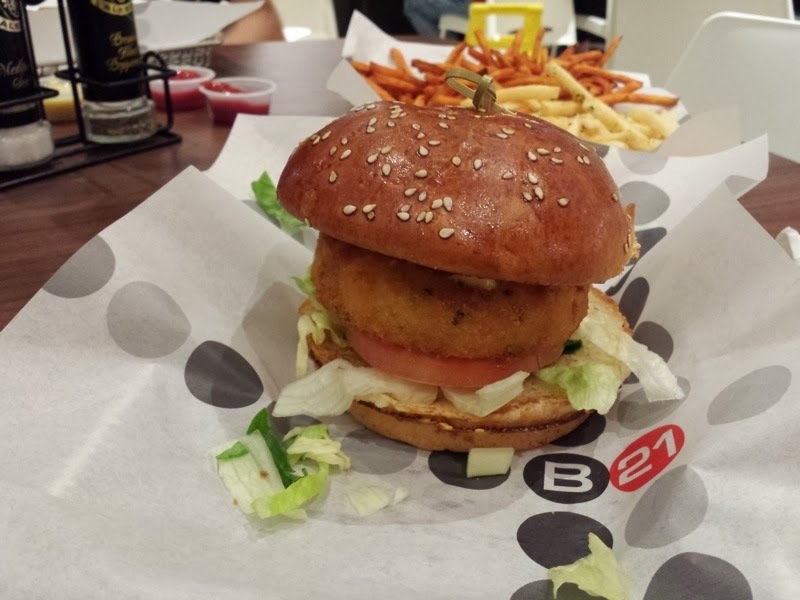 I had dinner one night at a restaurant called Burger 21 near Millenia Mall in Orlando. 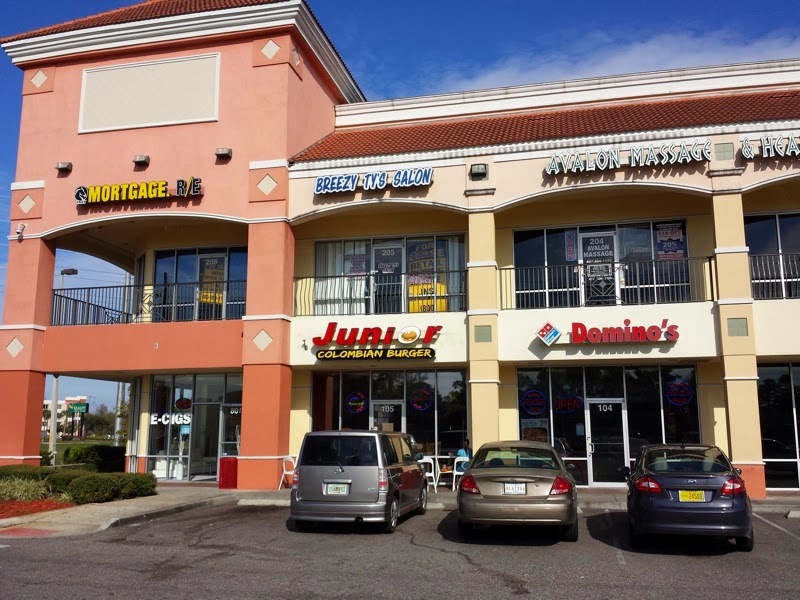 This is a chain with a few locations in the Orlando area. I started out the meal by sharing an order of Half & Half Fries. 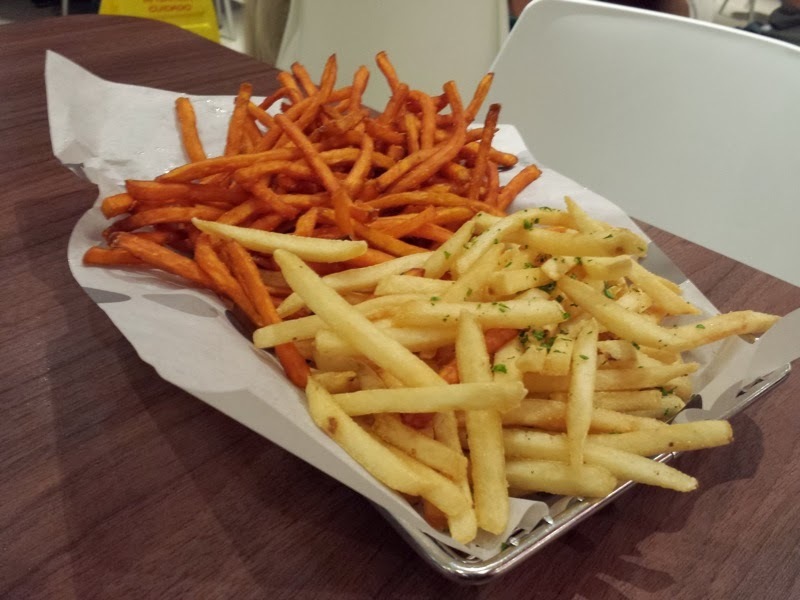 This was a basket of half regular fries and half sweet potato fries. The fries by themselves were okay. Nothing exceptional, but the fun part was dipping them in all of the sauces that were available at their sauce bar. My favorites were the Chipotle Mayo, Cajun Mayo, and totally unexpectedly, the Toasted Marshmallow. The person I ate here with ordered a plain cheeseburger and wasn't all too happy either. He ordered it medium-well, but it was served very pink. Apparently this was a theme because I noticed a couple more people sending their food undercooked food back.